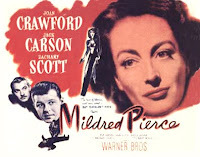 I had hoped to see MILDRED PIERCE next month at the Film Noir series currently being hosted by the Academy of Motion Picture Arts & Sciences, but when I tried to order tickets last week I discovered the screening had already sold out. If I'd realized tickets would sell out so much more quickly than the recent Noir City Festival at the Egyptian, I'd have committed to ordering tickets sooner! It's good news, however, that there are so many film fans interested in seeing a classic movie. Ann Blyth will be making a personal appearance so it should be a very special evening indeed. We instead did the next best thing, and my daughters and I watched it tonight on our large TV screen. The DVD print is one of the best I have ever seen in all my years of DVD watching; the movie's amazing look combined with the quality of the DVD provided a top viewing experience. 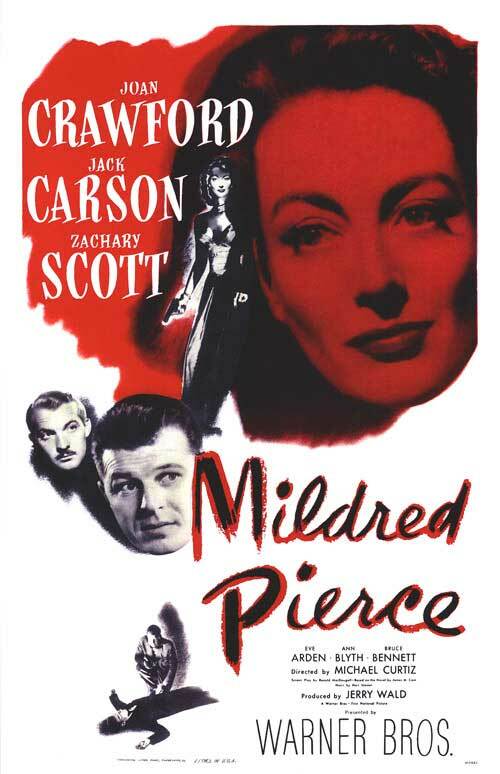 I had never seen MILDRED PIERCE before, and although it's a very dark movie, it really blew me away. It was a very impressive film. 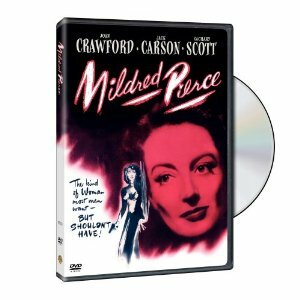 We flash back in time to Mildred's unhappy marriage to Bert (Bruce Bennett) and her obsession with providing her daughters Veda (Ann Blyth) and Kay (Jo Ann Marlowe) with the best of everything. Following a divorce Mildred ekes out a living as a waitress, a profession which embarrasses her snooty daughter Veda. Eventually Mildred builds a restaurant empire, but no matter how hard Mildred tries, she can't make Veda happy. Veda grows into an evil young woman, yet Mildred keeps enabling Veda's behavior and trying to win her love. Joan Crawford won a deserved Oscar for her performance in the title role. At one time I didn't care for Crawford, but I've gradually come to enjoy her work, and she was superb in this, playing a flawed but very interesting character. She's on screen the vast majority of the time, and she's fascinating from start to finish. The fine cast also includes Lee Patrick, Butterfly McQueen, Moroni Olsen, and Veda Ann Borg. The film has a fabulous look, from the set design to the costumes and especially including the cinematography. It's hard to imagine that Ernest Haller's stunning black and white cinematography didn't win the Oscar. The winner that year was Harry Stradling Sr. for THE PICTURE OF DORIAN GRAY. Other contenders included SPELLBOUND, THE LOST WEEKEND, and THE KEYS OF THE KINGDOM. The movie was directed by Michael Curtiz. It runs 111 minutes. 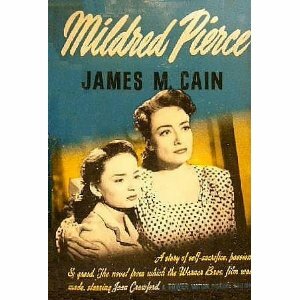 MILDRED PIERCE is based on a novel by James M. Cain, who also wrote DOUBLE INDEMNITY and THE POSTMAN ALWAYS RINGS TWICE. The film made me think of the later Warner Bros. film NORA PRENTISS (1947), which might just be the darkest melodrama-noir ever made. Each film is named for the lead female character. Bruce Bennett appears in both films, they share California locations (Northern California for NORA PRENTISS, Southern California for MILDRED PIERCE), and there are similar themes about a character whose refusal to be happy with a nice life leads to utter disaster. The final shot in NORA PRENTISS, as two characters walk away after justice has been served, echoes the last shot of MILDRED PIERCE. DVD extras include a Crawford trailer gallery and the 2002 documentary JOAN CRAWFORD, THE ULTIMATE MOVIE STAR. The DVD was reviewed by Glenn Erickson at his DVD Savant site. He describes the DVD as "a killer restoration of Ernest Haller's crisp & moody B&W cinematography." DVD Verdict calls the DVD transfer "stunning" and "startlingly good." There's more on the film from Steve-O at Noir of the Week. 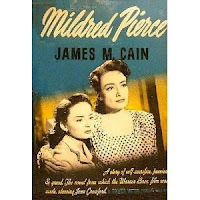 MILDRED PIERCE is also available on VHS. Update: In April 2013 I was thrilled to see Ann Blyth at a MILDRED PIERCE screening at the TCM Classic Film Festival. 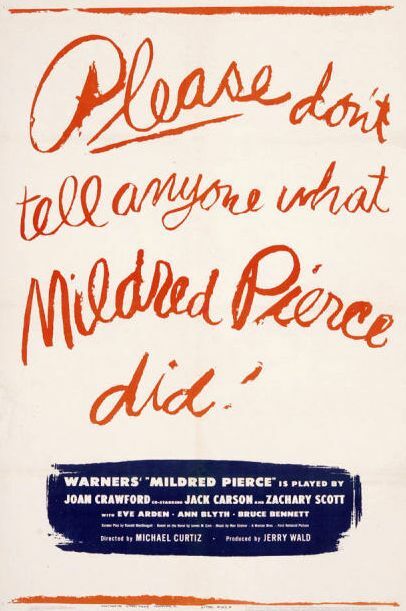 Yesterday Robert Montgomery and today Mildred Pierce. I am hooked. I am fond of saying I was weaned on James M. Cain (and a few others) during the early days of the paperback revolution. Pierce is in the top rank of his books, and I think just a trace below the big two (Indemnity and Postman) as a film. (Serenade fared poorly.) And quoting Glen Erickson makes sense – he is very knowledgeable in the field. I particularly liked your comparing Pierce with Nora Prentiss, the bleakest of tales. And finally, knowing another of your other interests, I did a post in March (From a Personal Film Library 6) on the James M. Cain Cookbook. I guess you could say Cain taught Mildred Pierce how to cook. Thank you for keeping Cain’s offspring fresh. Will respond to your message separately. Well, I can't help it. 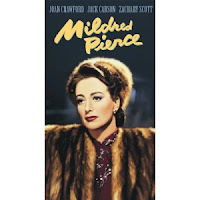 Whenever I hear of the movie "Mildred Pierce" I can't help but think of the skit Carol Burnett did called "Mildred Fierce". It also had Soupy Sales as her secretary. Here is a link to the YouTube clip that you can copy and paste. A James M. Cain Cookbook? I'll definitely be checking that out, Gerald! I'm glad you enjoyed the comparison of MILDRED and NORA. Thanks very much for your note. Irene, thanks for the link! Loved her wardrobe and hairstyle.